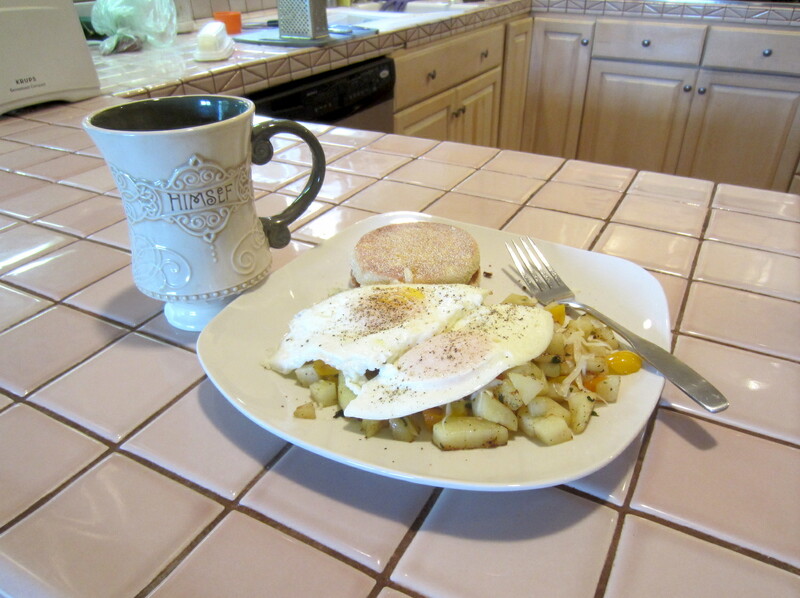 The fabled Three Pepper Hash, topped with two eggs over easy, an English muffin, and a mug of Lucky Irish Breakfast tea with lemon and honey. And on the seventh day … well, he didn’t exactly rest. There was dog-walking, and cooking (my fabled Three Pepper Hash for breakfast). Both lawn and skull received a vigorous clipping. You get the idea. But there was no cycling today. I could’ve squeezed in a short ride before the weather uglied up, maybe, possibly, but I didn’t feel like it, so there. • “How Can America Recover From Donald Trump?” From the NYT editorial page, where someone is having a good deal of fun writing hand-wringing editorials lately. • “‘Racialists’ are cheered by Trump’s latest strategy.” Not nearly as fun a read, but hey — we’re talking about the button-down klavern here. I remember when the sonsabitches wore sheets instead of seersucker. From The Washington Post. • “Does Henry Kissinger Have a Conscience?” From The New Yorker. I expect you already know the answer. This entry was posted on August 21, 2016 at 12:59 pm and is filed under Assholes, Cooking, Sloth. You can follow any responses to this entry through the RSS 2.0 feed. You can leave a response, or trackback from your own site. I hope you read those articles after breakfast, not during or before. Shame to ruin a good meal. On our ride this morning we passed two men and a woman dressed in the traditional black clothes for crossing the border at night through the Huachuca mountains. First group like that we have seen in over a year. Hiking down the bike path they were, smiling and saying good morning to us. One was on the cell phone calling for extraction. Now, I am off to google three pepper hash recipes. Grab a couple-three red spuds, peel and chop coarsely, then microwave for five minutes. Dice about a quarter each of three bell peppers. I used red, yellow and orange today, but I like to get some green in there if I can, usually a jalapeño, but a bell will do. Chop a few scallions, or maybe some white onion (if the latter, rinse with hot water for a while to cut down on the powerful oniony smell/taste if you’re married to someone who hates onions). Mince a clove of garlic or two. Chop a handful of flat-leafed Italian parsley, or cilantro, or arugula, whatever floats your boat. In a large skillet, melt a couple tablespoons of butter (or use olive oil if you prefer, or a mix thereof), toss all the previous ingredients — including the microwaved spuds — into the sonofabitch, add a bit of salt and pepper to taste, and fry for about 10 minutes. You can add a bit of meat if you like. I’ve used leftover poached chicken from enchiladas, bits of leftover pork chops, bacon, ham, chorizo, pretty much anything that happens to be close at hand when rooting through the fridge. Top it off with a little grated extra-sharp cheddar and a couple of eggs and you’re good to go. Here’s what it looks like in the pan, without eggs covering it. Guess I need to score a few green chiles at Thursday’s Farmer’s Market. Sandy loves onions. Me too, especially Vidalias in season. Caught that bug when I lived in Georgia. Enjoy the rest of this laid back day. Now I need to go back to the store for red potatoes and cilantro. Probably before dinner time. Thanks. I have to figure out how to do that. Hm, I thought you guys might have fill-in-the-blank access to basic HTML coding shortcuts in comments. I just checked using a ‘puter that wasn’t logged in to the backend and it looks like not so much. No worries, I can keep changing it. I used to have to write all that code by hand back in the bad old days of the Original Dogs(h)ite. Self-taught I was. Then I found out about PageSpinner, a basic HTML builder, and finally got into Blogger, Typepad, WordPress and all the other freebies out there. WP is the one I stuck with. At its most basic, a text link looks like the code in “Really awesome link” in this example. I think the WordPress gnomes will automatically rearrange it to suit their particular style. Breakfast looks good! Made something very similar this morning. Watched the men’s Olympic MTB race on tv and online – no spoilers here. Lots of scorched earth where the controlled burn got out of hand earlier this week. Interesting to see ALL the finishers and their reactions. Some devastated, for some it was a victory that they crossed the line and were not lapped. It was a final or only Olympics for some and very emotional for many. Saw the post – race and medal ceremony on the NBCSN app. Coverage of Trumpenführer’s finances – it’s the New York Times via The Boston Globe. Patrick, I like your mug, Himself with the Celtic decorations. Thanks, Libby. Herself scored those during a visit to Chicago (hers reads, of course, “Herself”). They are cool, aren’t they? i had 2 day old pb&j sandwiches and coffee on the way to trail maintenance at 6:00am. yours looks better. Well, yeah, two-day-old PB&J is OK for trail maintenance. But for crucial bits of bloggery a guy wants to carbo-load, don’t ya know. I think they can re-wrap the greasy, orange turd that is Drumpf any way they like, but he’ll still stink. His new campaign (is this the 3rd?) guy is almost as big a turd as he is! How this will broaden Drumpf’s appeal is beyond me. Wasn’t this guy in charge when Drumpf said the black folks in the USA should vote for him, asking “What have you got to lose?” The whole thing is funny…..except that it’s not. Dude for sure “has got a diagnosis,” as Herself would say. If this is how he behaves in public, just imagine what he must be like in private. No, scratch that, it’s too early to start drinking. You know what your wife says. I also find it interesting that he is raising money but not spending much of it. I can’t believe he would throw away $47 mil of his own money on a failed campaign. If it was his own money. The NYT has an interesting take on that. He’s using the GOP for all the heavy lifting … so, basically, he’s operating his “campaign” the same way he does his businesses, by mostly burning up other people’s money. I don’t believe this con-man really has any money. He’s really good at spending other people’s and running up debts that he defaults on. Probably why he’s not letting anyone see his tax records?